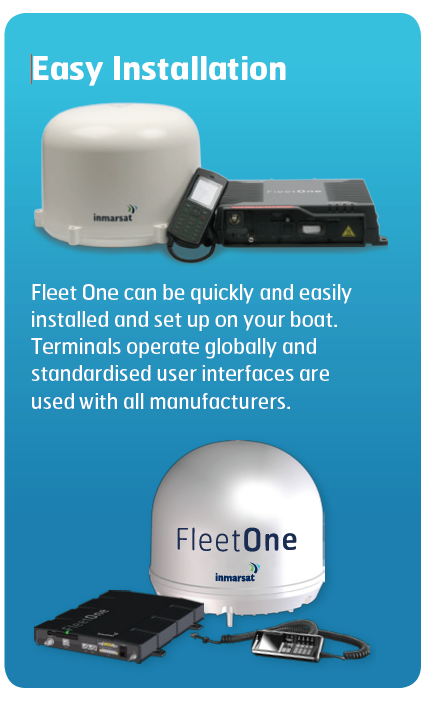 Fleet One has been designed with the fishing industry in mind, in order meet specific operational demands for cost effective data and voice simultaneously through a compact antennae, all with specialised pricing plans and seasonal flexibility. Connectivity and communications at sea has become an expectation as it is on land. Improve your operations whilst enhancing fishermen’s welfare by low cost contact with family at home. Communications assist with fishing operations such as navigation, route planning/ optimisations, fish finding, fisheries governance and other regulations, LIFE fishing, catch reporting whilst reducing fuel costs. 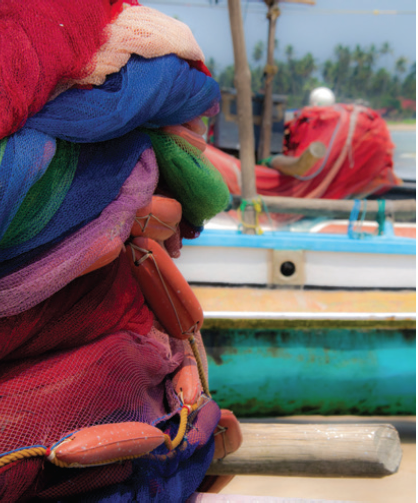 For the fishermen it can improve their morale on-board by low cost calls and emails to family at home, being able to check the news or sports results and feeling connected on the fishing boat to life on the shore. This can all be done whilst keeping a tight control on costs. Fleet One operates on Inmarsat’s I-4 satellites which are rigorously tested and proven as the choice for commercial mariners around the world. Fleet One supports Inmarsat’s unique ‘505’ safety service, which in an emergency routes you directly to a MRCC. This means that in one phone call you can alert the safety services of your position and nature of distress, by reassuringly speaking to the Search and Rescue Services knowing that assistance is on its way. Fleet One provides constant access to voice and data services, in a very cost effective manner. 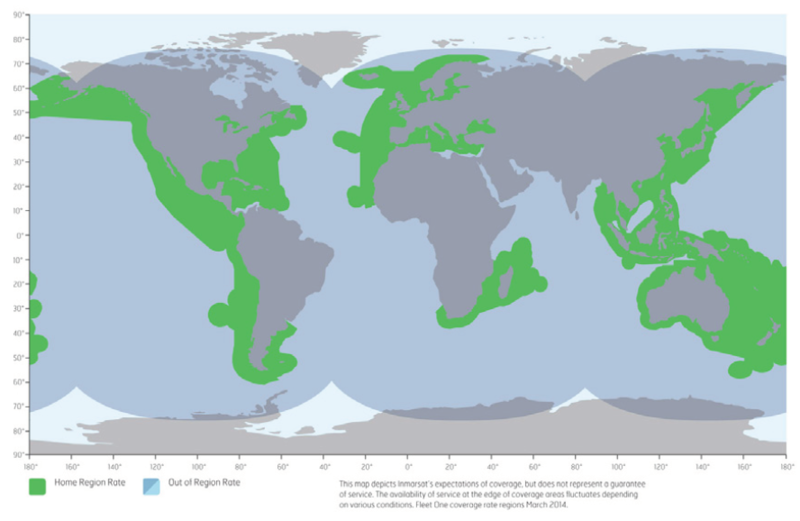 Fleet One has full global coverage with low cost preferential regions to benefit key regional fishing grounds. New pricing plans from Inmarsat that take into account seasonal variations to give the flexibility required in this industry. Fleet One gives a very cost effective and competitive pricing for sailors and leisure users to access the internet, write emails and make phone calls. Fleet One has a standard “plug and play” Ethernet connection to a computer, and can support smart phones, tablets and computers via an additional wireless router, allowing access to specific maritime applications. A wireless router would allow multiple people to access the internet and email at the same time. You can depend on Inmarsat, whatever the weather. We provide the most robust communications links, with average network availability greater than any mobile phone provider and exceeding 99.9%. 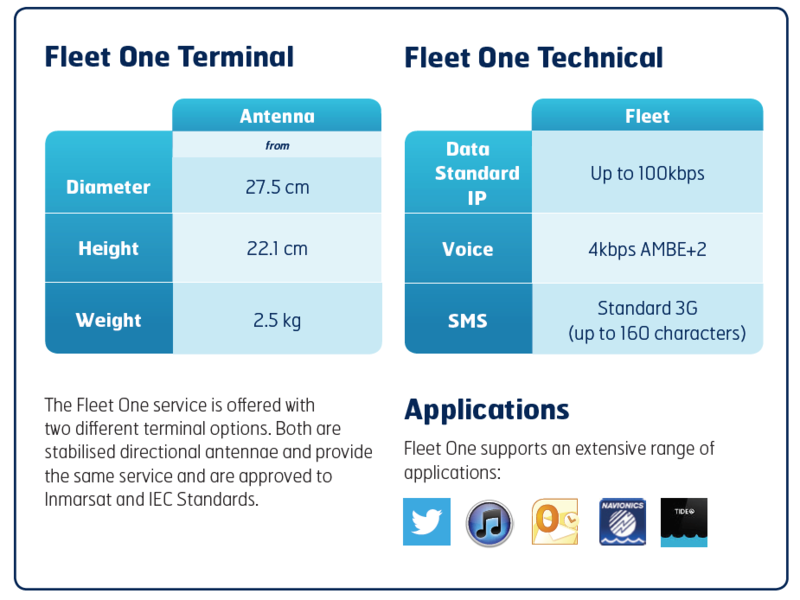 Fleet One terminals are specifically designed for use within the maritime environment. The terminal is quick and easy to install, with additional WiFi capability to allow access to smartphones/tablets as at home. The terminals have been tested and approved to Inmarsat’s exacting standards.